The folks at NVIDIA are taking this mobile gaming thing as serious as anyone these days. For months now, we have enjoyed their TegraZone app which highlights any game that has been optimized for devices running Tegra processors. So to help further influence this world of mobile gaming, NVIDIA has unveiled the new TegraZone.com website as well as an easier way for developers to submit games that they believe are on good enough to be featured as a Tegra-optimized title. Through this new site, you’ll find many of the same great features you found through the TegraZone app (which updated today by the way), only you can access it from anywhere and at any time. You will see high res screenshots, videos, interviews with developers, and more. Oh, and to celebrate the launch of all this gaming goodness, NVIDIA is giving away five (5) Acer Iconia Tabs, plus 15 t-shirts. Press release and full details after the jump. www.tegrazone.com gives consumers another way to access all the great Tegra Zone content, whether you’re on your PC, Mac, laptop, or other mobile device. That includes professional game reviews, high-res screenshots, HD videos, game developer interviews, the latest gaming news, and more. Consumers get everything found in the app, along with extras such as community forums. After you click on the Facebook Share or Twitter Tweet button, a pop up window will show what you would share if you proceeded. Please do not continue by clicking on the “Share Link” or “Tweet” button, as this will broadcast the beta URL to your followers publically. 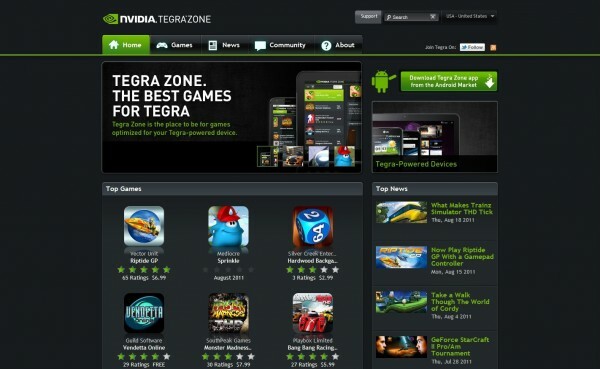 To encourage more game developers to develop for Tegra, NVIDIA has created a new “Zone In” section under Tegra Developer Zone at http://developer.nvidia.com/zone-in. Via an online submission form http://developer.nvidia.com/content/zone-application, developers can get their game in front of NVIDIA. Submissions will be reviewed and play tested, and each submission will receive a personalized response from NVIDIA regardless of the outcome of the submission. Developers accepted into the program will get their game into Tegra Zone. Motorola Tweets About Our "OG" DROID Friend, Hints At The "Next Big Thing"
HTC Sense 3.5 Makes Pictorial Debut, Could Run on Older Phones?